Emergency Backup Phones To Ship In March… Backup Phones? What do you do if you’re on the road and your cell phone dies? Or perhaps you don’t normally carry a cell phone, but you have an emergency and need to make a call. You reach for your emergency/backup cell phone. At least that’s what one company plans to offer to shoppers for dealing with these types of circumstances. The SpareOne cell phone will be available for approximately $50 and is set to launch in March. According to SpareOne, the phone carries a charge for up to 15 years. That assumes it’s not being used (the company recommends a long lasting Energizer Ultimate Lithium L91 AA battery be installed for maximum shelf life). 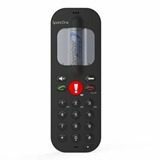 When needed, the caller pulls out an isolation strip that goes between the battery and the cell phone’s contacts (to prevent battery drain). A call can then be made. If the phone is used and the battery runs down, it can be replaced with another AA battery, no ‘cell phone charger’ required. The isolation strip can also be reinserted when the phone is no longer needed and is being returned to storage to await the next emergency. The SpareOne cell phone can be used with a SIM card like a regular GSM phone. Or in the case of emergency, it can be used to dial 911 without a SIM card. SpareOne is offering to send an email shoppers once the phones become available. The sign up form is on their site here. Will shoppers be willing to spend $50 on a backup phone? There are other inexpensive phones that can be purchased without contracts and stored for emergency use. What’s unique about the SpareOne is that it is designed for long-term shelf life without the need for a regular recharge. And when it does need to be recharged, it uses an AA battery. We’ll keep an eye on this one and provide updates as they come in.